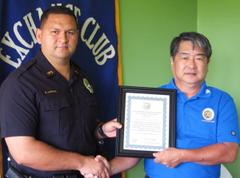 The Aloha Exchange Club of East Hawaiʻi recognized Officer Erhard Autrata on Thursday (August 25) as “Officer of the Month” for August. It was Autrata’s second such award this year. The Hilo patrol officer was honored for what his supervisor described as his “continued commitment and dedication” to arresting drunk drivers. In 2010, Officer Autrata made 59 DUI arrests—more than any other patrol officer in the Police Department. Autrata has already surpassed that with 63 DUI arrests for the first half of this year, said Lieutenant Robert Fujitake, who nominated Autrata for the award. In May, Autrata made 30 DUI arrests, “topping his last record of 18 DUI arrests in February 2011,” said Fujitake, who also commended Autrata for his outstanding work ethic.